Picturing Mary: Woman, Mother, Idea focuses on themes of femininity, motherhood, and ideal women expressed through the image of the Virgin Mary. The lives of women artists whose work is on view, including the Ursuline nun Orsola Maddalena Caccia, illuminate women’s varied roles in their culture. Some of the earliest known female painters of the Italian Renaissance were nuns. Religious orders often encouraged nuns to create art as a means of devotion, as well as a means of financial support for their institution. Caccia is an example of a successful nun-as-painter. Orsola Maddalena Caccia (Moncalvo, Italy, 1596–1676),was born Theodora. Like the more familiar Artemisia Gentileschi, who was trained as a painter by her father, Orazio Gentileschi, Caccia was trained by her father, Guglielmo Caccia, who created large-scale religious works. She was renamed Orsola when she took her vows and entered an Ursuline convent in 1620. Five years later, she joined the Ursuline convent in Moncalvo, which was founded by her father. Although five of her sisters joined her in the convent, only Orsola and her sister Francesca became painters. None of her sister’s work remains, but viewers can still find many of Orsola’s artworks in the spaces for which they were commissioned. Caccia’s father’s influence on her career persisted even after his death: Guglielmo left artistic tools and drawings for his daughters at the convent for their use after his death. Despite the steady business of painting at the convent, his will stipulated that these tools be returned to his male heirs after all six of his daughters had passed away. Despite this dynamic, Orsola’s paintings provide evidence of female agency in art. 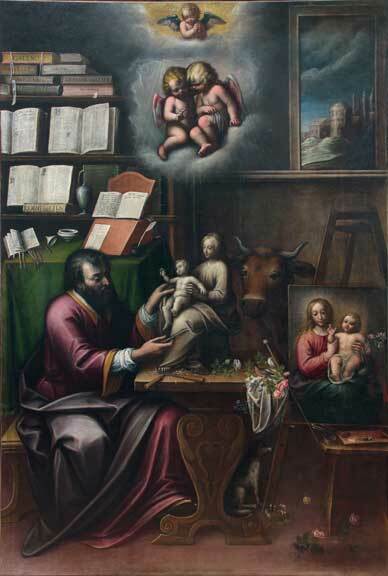 Painting was encouraged in the Ursuline order, as it provided a means of support for the religious institutions. She became abbess and organized a painting studio within the convent. She created flower paintings during this time, as well as large-scale religious works and altarpieces, many of which feature carefully detailed renderings of still-life objects. These act as small reminders of the daily lives of the painting’s subjects; for example, a painting of the birth of John the Baptist is made all the more real by the delicately painted stoneware that litters the foreground, and Caccia also included details showing the exact foods served to women who had just gone through labor. 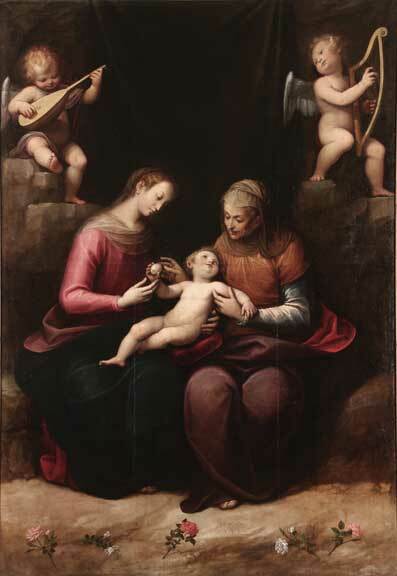 Orsola Maddalena Caccia’s work provides important examples of paintings created for patrons who sought artwork made by a female religious artist. 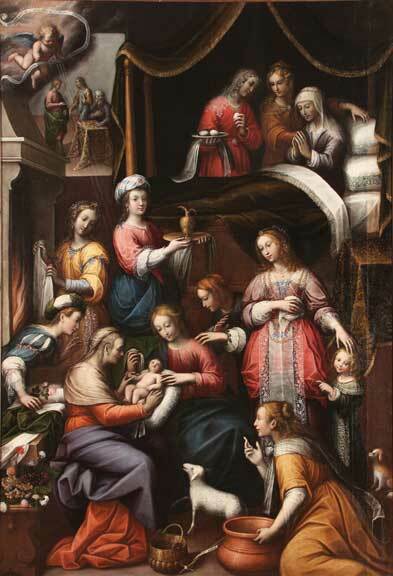 Her careful consideration of the details of place and scene gave her a unique voice among the heavily male-driven art world of Renaissance Italy. 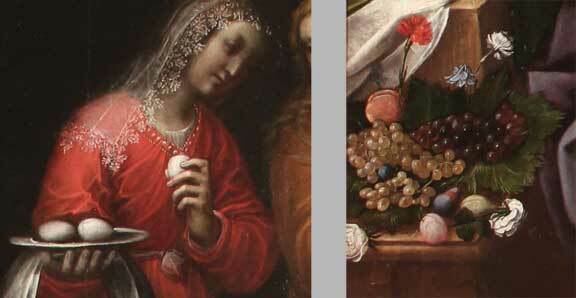 Click here to learn more and plan your visit to Picturing Mary, open through April 12, 2015.